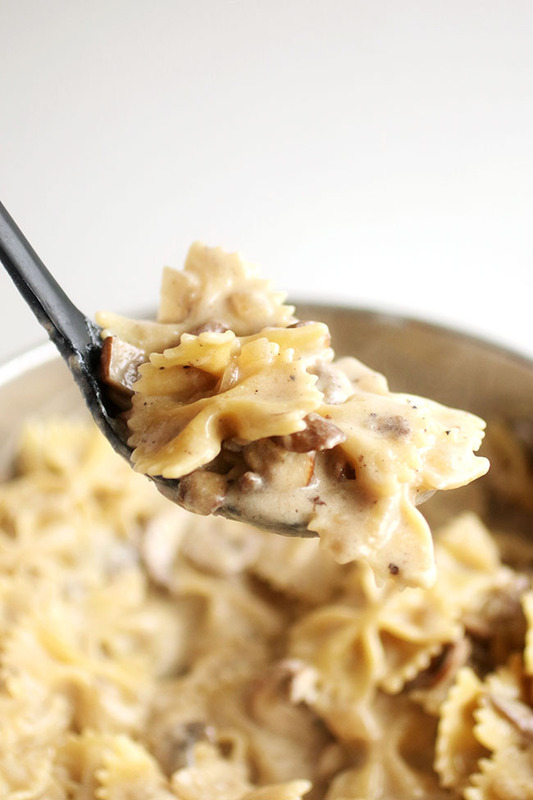 Creamy mushroom pasta with an easy mushroom white sauce, garlic, and no heavy cream. Ready in 30 minutes. 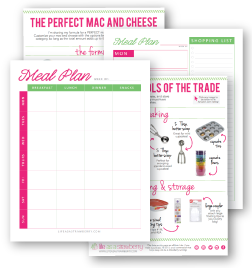 Welcome to one of the easiest meals on the planet. (Besides pouring cereal or heating up leftovers. WHICH DO NOT COUNT). 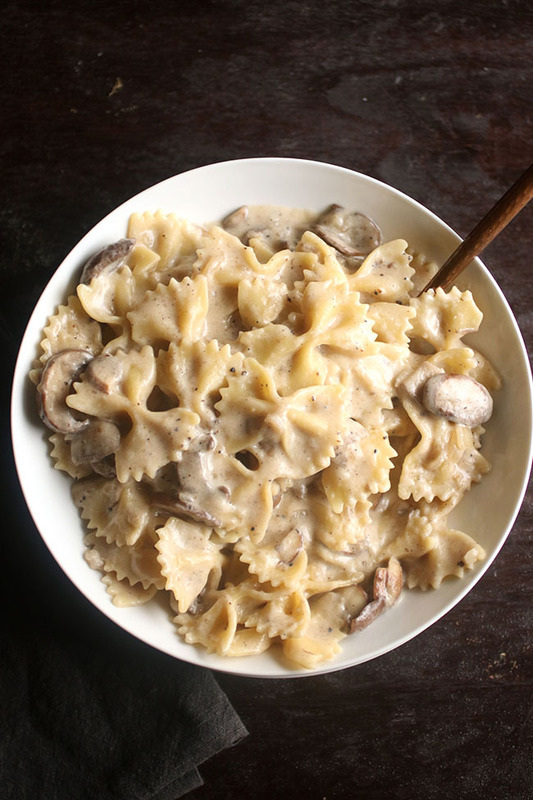 This creamy mushroom pasta is easily top 10 on the list of my favorite things ever. I probably make some variation of it at least once a week because it’s so dang quick and simple. Just your favorite pasta, an easy garlic mushroom pasta sauce, and any other proteins or veggies you have on hand. Plus, y’know, any excuse to say “shrooooooooms!” in a singsongy voice over and over while I make dinner. This is the perfect “we-have-no-food” food. 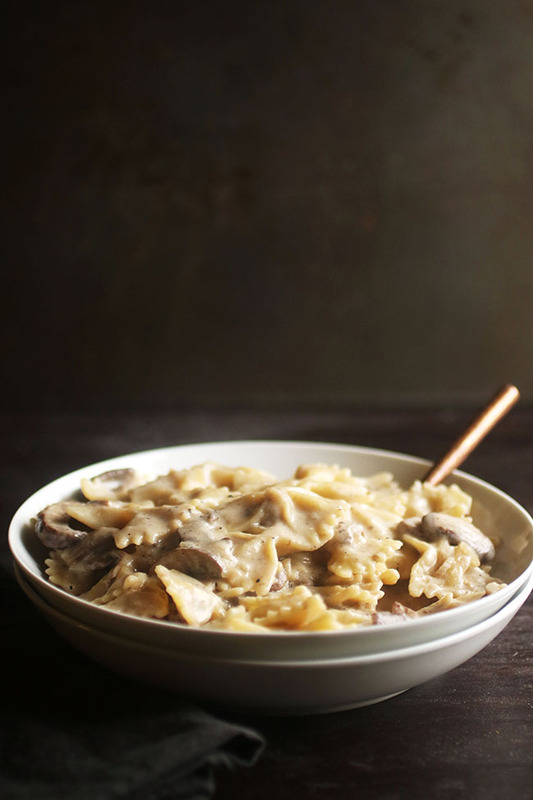 Even when our fridge is at its emptiest and our grocery shopping procrastination level is at its highest (so, basically every day of my life), I just about always have the stuff on hand to make this creamy mushroom pasta. 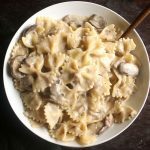 But the beauty of this creamy mushroom pasta is that it doesn’t even necessarily have to be creamy mushroom pasta – you can substitute anything you have on hand to make it a complete dish. Out of parmesan cheese? Swap some cream cheese, goat cheese, or shredded asiago or romano. No mushrooms? NO WORRIES! Just make the sauce and toss in some broccoli or spinach or whatever else you’ve got. No pasta? Order takeout. Carbs are non-negotiable. (KIDDING. Sort of). You can use rice or spaghetti squash or even slather the sauce over some baked chicken if you’re out of pasta (⬅ This is actually really good and it’s making me feel kind of bad about my pasta-only comment. But not so bad that I’m going to scroll all the way back up the page and delete it. So there we are. Sorry, chicken, but PASTA 4 LIFE). 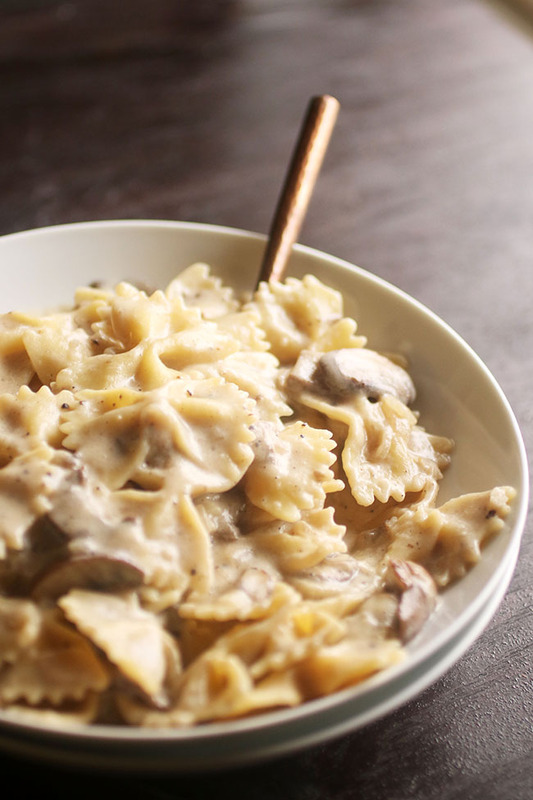 Which reminds me, you could also totally add chicken to this creamy mushroom pasta. 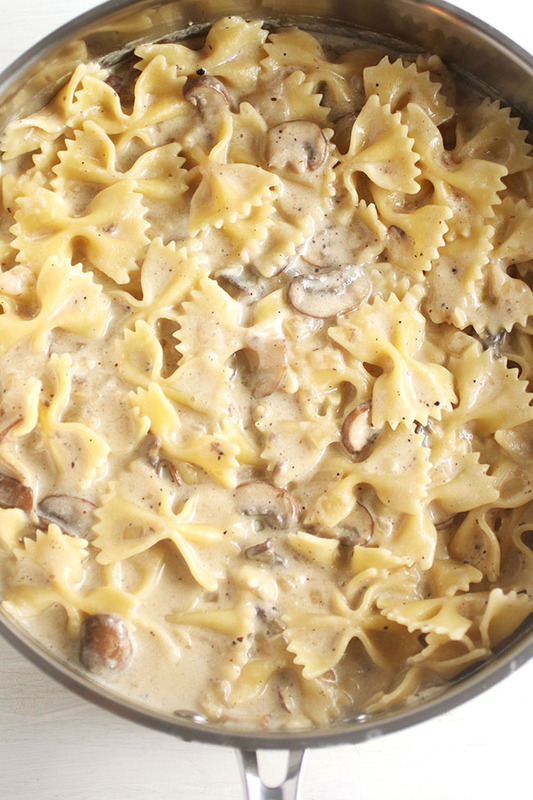 Easy, creamy mushroom pasta with a tasty parmesan sauce. Cook the pasta in very salty water until al dente. Drain and set aside. Return the pasta pot to the stove. Add olive oil and turn heat to medium. Add garlic and onion to oil and sauté until onion has softened, about 2 minutes. Add sliced mushrooms to oil and cook until they begin to brown, about 5 minutes. Add salt and pepper to taste and stir to combine. 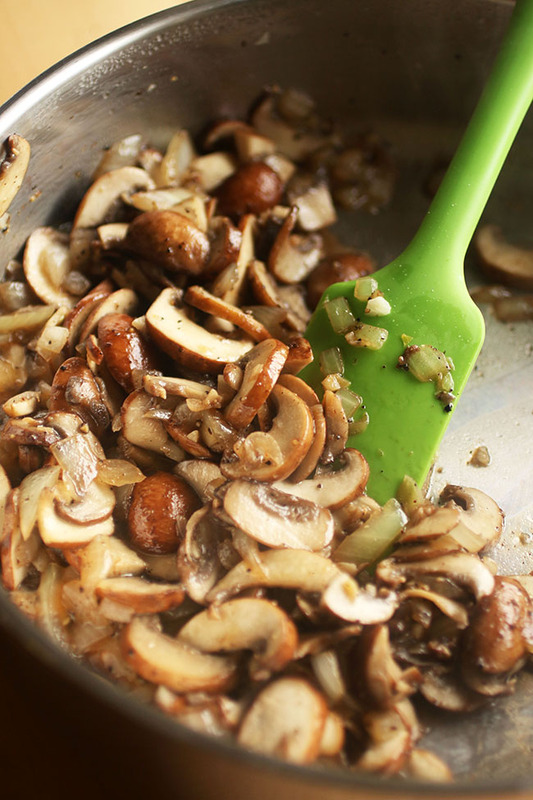 You should notice a bit of liquid in the skillet with the mushrooms – this is what you want! If your pan looks dry, add another tablespoon or so of olive oil so you have enough liquid to form a roux in the next step. Add flour to mushroom mixture and stir to help the flour soak up any liquid and form a roux. Cook for 1 minute. Slowly add milk to mushrooms, stirring constantly to break up any chunks of flour. Cook 5-7 minutes, stirring occasionally, until sauce has thickened. Remove sauce from heat and stir in shredded parmesan cheese. Add cooked pasta to sauce and toss to combine. Serve immediately. Shred the parmesan cheese yourself for best results! Pre-shredded cheese often has preservatives applied that prevent the cheese from melting smoothly. If you’re a strict vegetarian, use vegetarian parmesan cheese (look for parmesan cheese made without rennet). This is a great base recipe – customize it with whatever you have in the fridge! I like to add leftover chicken or turkey, steamed broccoli, peas, or chopped spinach to mix the recipe up a bit. Play around to find your favorite combinations and make it your own! If you’re feeling fancy, you can always garnish your pasta with an extra sprinkle of parmesan cheese or some fresh chopped parsley. I added some toasted walnuts and a bit of chopped, preserved lemon. Awesome! Hi Angie! Yum! Thank you. Nice recipe. Will try it for my toddler. I made this on a whim today since I had all the ingredients on hand. 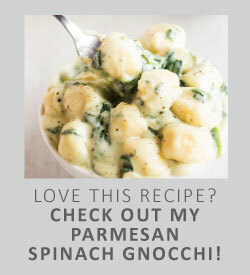 It was quick and easy to make, but most of all DELICIOUS! Thank you.so much for this recipe! Wahoo! We’re so happy to hear that, Jordi – thanks for letting us know how it turned out! Hi Jordi – wonderful! Thank you. Made this tonight and it was easy and fabulous! I had a leek that I needed to use, so subbed that in for the onion and added in some broccoli. I would definitely make this again.